Malaysian trumpet snails – MTS (vtuberculata) is a very spread tank snail which is at the same time loved and hated by aquarists. On the one hand, trumpet snail eats feed leftovers, algae and they perfectly mix tank bottom substrate to prevent it from getting sour. On the other hand, these snails breed to produce a huge number of species and this can become a complete disaster for a tank keeper. Shellfishes of Melanoides kind are from Thiaridae family and Gastropoda shellfish class. Nowadays this snail has got quite a lot of names – Malayan Burrowing Snail, Malayan Mud Snail, Red-rimmed Melania, Dominican Trumpet Snail. Their area of habitat is rather wide. They can be seen almost through all Africa – from Morocco to Madagascar, in Asia – from Turkey to Malaysia and in Australia. Due to malaysian trumpet snails high adaptivity they continuously explore new areas: South of Northern America, South of Europe and etc. have already become their new habitats. In the wild this shellfish inhabits in small waters with low flow, where they occupy mainly sandbanks and riverside areas up to 1 m deep, however they were also seen at about 3-4 m deep. These snails prefer soft bottom consisting of mud, sand and clay mixture. There they form quite high populated colonies. From one square meter of such bottom substrate one can get about 1.5-2 thousands of species and if the substrate is extremely reach with feed one can get about 30-35 thousands of shellfish from the same sized area. Trumpet snails diet consists of lower algae, semi-decayed organics and etc., which means that these snails are typical detritus eaters. When looking for feed they actively move round a tank bottom and deepen into it at the condition that it’s loose enough and not pressed by stones and thick doubling of plants’ roots. Unlike the majority of freshwater snails known by aquarists trumpet snails breathe with the help of grills, i.e. they are capable to digest oxygen saturated in the tank water and they don’t need to go to the water surface to get some ear. They even breed unlike the others – viviparity is characteristic for them. In the references as for aquarium husbandry according to traditions only one type of these snails is mentioned – Melanoides (Oliver. 1804), namely Melanoides tuberculata (Mueller. 1774). But it would be wrong to consider this kind a monotypic one, because actually it has at least two more species: Melanoides riqueti (Grateloup, 1840) that inhabit in freshwaters of Singapore and Melanoides granifera (Lamarck. 1822) that inhabit in small rivers and streams of West part of Malaysia. In some specialized literature these species can be named Tarebia granifera or Tarebia laterilia. Besides above mentioned species there are also Philippians shellfish Melanoides turricula (Leo. 1862), however their classification isn’t final yet: as for morphological characters they are very close to Melanoides tuberculata and many biologists give them just a position of the snails’ sub-kind. At the same time these snails differ in ecology. So, if Melanoides tuberculata may be more often seen is slow flow and impounded muddy waters, unlike it Melanoides tumcula prefers rivers and streams with high speed flow and clean transparent water. Basing on these facts some part of biologists consider these snails as a separate kind. Amateurs usually deal with Melanoides tuberculata. Snails of this kind are essential part of indoor tanks’ ecosystem. It’s rather hard to trace back these species history and how they got into aquarium husbandry. It seems more likely that they were accidentally brought in together with plants from some Asian or African waters. They travel from tank to tank the same way nowadays. To avoid such a migration is difficult enough: it’s hard to see small snails in the plants even using a magnifying glass. Besides, it’s even more hard to find them in a mixture of gravel and pebbles. To free the substrate from shellfish completely such a tough measures are required as boiling or annealing of the substrate and they aren’t always doable (in case of big capacity tanks, for example). Luckily, such situations occur very seldom. Melanoides tuberculata has an elongated shell that in its widest part is about 5-7 mm in diameter and it is 30-35 mm long (in specialized literature some giant snails are mentioned to be about 7-8 cm long). The snail main color is gray with some admixture fo greenish, olive, brown colors in different proportions. Spiral turns of the shell are wider and more saturated near the beginning. Rust-coloured dashes are rather noticeable on the spiral turns and they are usually parallel to the shell axis. These dashes’ length, width, color and their pattern are individual for each snail. Hardy. Harmless. Hard to kill. Hard-working. Very seldom one can see an MTS snail which has several first spiral turns that completely differ from the rest – such species look very scenic, especially of there’s a combination of dark and light areas. However, one has to mention that if there’s a moderate number of snails in a tank, decentish permeability and airing of substrate you won’t see Melanoides tuberculata in a lighted tank very often. It’s not that they are timid, but it’s their burrowing behavior makes them tend to dig into the substrate. The burrowing speed depends on the substrate structure: the smaller the particles are, the faster the snail burrows. By the way, the opinion that MTS snails can live just a few hours without a substrate is rather exaggerated. Lately, another kind of Melanoides snails has appeared in tanks – Melanoides granifera. In my opinion, they are more good-looking than their relatives. Their cupola-shaped shell is colored in saturated gray-brown tints. It’s more proportional: the cone height is smaller (up to 2 cm) and the diameter is larger (1.0-1.5 cm). The old spiral turns of the shell have slightly goffered pattern with light, almost white apexes and dark concaves. Possibly, this pattern defined the origin of these snails Latin name which literally means “the one carrying grains”. In literature written in English this kind of snails is called “Quilted melania”. Granifera snail habits differ a bit from the ones of its relatives. Besides, these snails are more thermophilic, more demanding as for the substrate content, but at the same time they are less attached to it. An ideal substrate for Granifera snail is the one with grains size 1-2 mm, i.e. only large grained sand. If the substrate is composed of more bulky particles it’s difficult for the snail to burrow its wide shell into it. On the other hand, Melanoides granifera spent more time in sight, spending their time on snags and large rocks. Therefore, if the appearance of common MTS snails on a tank walls, decorations and plants means that the climate in the lower tank layers isn’t good, the same behavior won’t mean a thing in case of Melanoides granifera. Granifera snails are more slow compared to Melanoides tuberculata. This concerns both the speed they move and adaptivity and breeding progress. Malaysian trumpet snails population grows extremely fast. It’d be quite enough for a couple of adult shellfish to get into a tank (they are species with virginal reproduction, that requires a partner) and just in a month or two there will be dozens of them in the tank. To get the same population number Granifera snails will need 6-8 month minimum. There is another one difference. If common malaysian snails spread equally all around the bottom substrate, Granifera snails form some kind of local communities on some specific bottom area each. For example, in my tank they are located near the bottom feedbox, which may be due to the presence of feed leftovers there and in other places these snails just aren’t able to compete with fast Melanoides tuberculata for feed. Nevertheless, both kinds of snails are good tank mates in one tank, also their habitats do often intersect in the wild, too. In my opinion, Granifera snails tend to become one of the popular objects of scenic tanks. The fact that they are good-looking and live in slow motion – both fact will surely play their part in its future popularity. Besides, the number of MTS snails (if the adult species aren’t removed from the tank) grows exponentially and in the end the substrate literally moves due to the number of snails burrowing it. At that Granifera snails will slowly explore the bottom substrate and their colony won’t grow that rapidly. Trumpet snail aquarium may be of any size, in the wild it can be any kind of waters, however they won’t do if the climate is too cold. They are incredibly enduring and they even can survive in a tank together with fishes that feed on snails (with Clown Loach, for instance). These snails have rather hard shell for Tetraodon to crack it and they also spend a lot of time burrowing, so it’s impossible to get them out from the substrate. So, the majority of their time Malaysian trumpet spends digging the substrate, this way they help the aquarists – they mix the substrate and don’t let it get sour. However, at night all of them come out on the surface. MTS snail is not in vain called a sandy snail, since sand is the easiest place for it to inhabit. However, it doesn’t mean that it can’t live in other substrates. They will do in fine gravel or even without any substrate in a tank with large cichlid fishes, for example. Such things as filtration, water acidity and hardness really don’t mean much, since trumpet snail will adapt to everything. At that, it won’t require any efforts from your side. The only thing these shellfish won’t take is cold water, since tropics are their habitats in the wild. Also trumpet snails create rather small biological load in a tank and even if their population is rather numerous they won’t influence on a tank balance. The only thing that suffers from their existence is a tank appearance. No special conditions are needed in a tank for MTS snails feeding, since they will feed on everything that remains from other inhabitants meals. Also they eat some soft algae and this way help to keep a tank clean. If you want to give some additional feed to the snails, you can give them any tablets for catfish, some boiled and sliced vegetables – cucumber, cabbage, squash. By this you can get rid of some excessive number of snails – give them some vegetables and take the snails that came to the food out of the tank. Trumpet snails are diclinous, so for breeding you’ll need a couple of shellfish. They breed very fast (sometimes too fast) provided with good tank conditions. In several months snails couple can turn into a colony of several dozens species. MTS snail juveniles grow at 5-6 mm of their length in month. 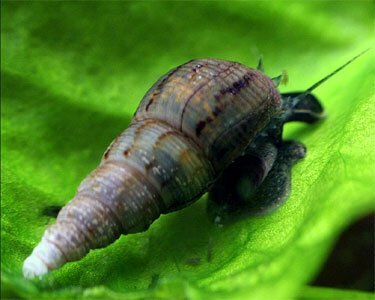 Nothing special is required for Malaysian trumpet snail breeding, since even small number of them can eventually fill even a large tank.